All air cushions are constructed of high quality and very pliable coated nylon for low shear and even lower interface pressures. Gaymar Plexus Quilted Top Sheet is highly vapor permeable and over-sized providing a low friction, low shear barrier against complications due to moisture. Machine washable. Unique modular design facilitates cleaning and interchangeability. 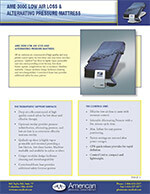 Convoluted foam base provides additional safety for your patient. Plexus quilted top sheet is highly vapor permeable and oversized providing a low friction, low shear barrier. 1. Power Switch / Indicator – Pressing this button toggles power on and off. An amber light indicates AC power is present to the controller, the controller is in standby. A green light indicates system is on, and running. The P2500 gives the caregiver the option of alternating low pressure therapy or static therapy with Low Air Loss. A simple push of a button on the control unit transforms the P2500 from a low air loss therapy system to one which can also provide alternating low pressure. 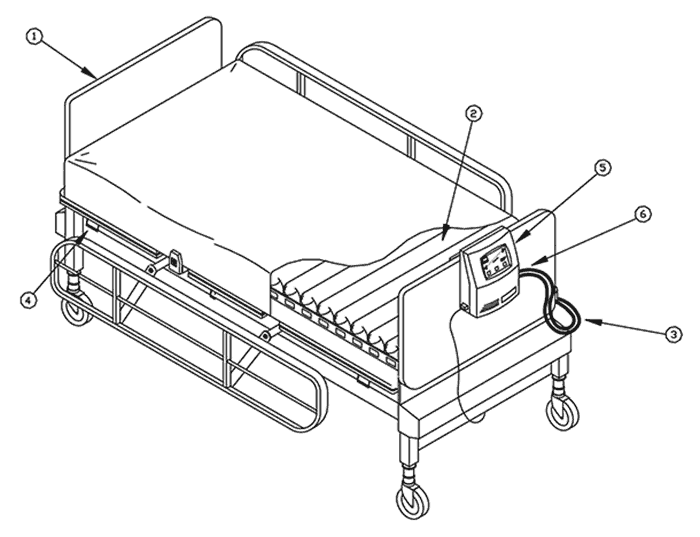 To assist in patient ingress/egress as well as normal nursing procedures, the air mattress can be maximally inflated by pushing the “MAX INFLATE” button on the control unit. Upon initiating max inflate condition, the mattress will rapidly inflate to it’s firmest level and maintain that setting for approximately 30 minutes or until “MAX INFLATE” button is pushed again. 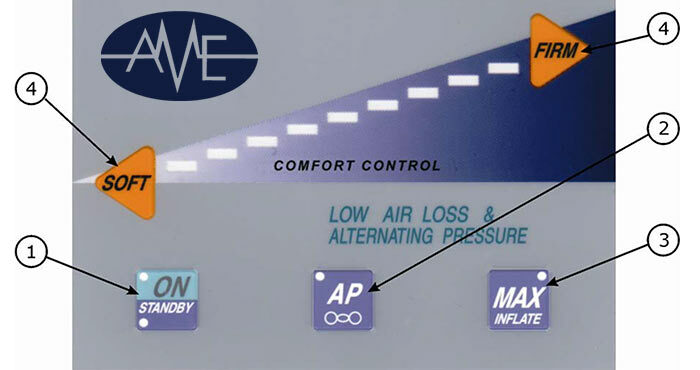 − “MAX INFLATE” button will remain illuminated while system is in maximum inflation mode. − If the “MAX INFLATE” button is pushed during max inflation mode, the button will cease illuminating and the system will return to previously chosen settings. − After approximately 30 minutes in the “MAX INFLATE” mode, the system is programmed to automatically return to the therapeutic settings. − Note: After automatically returning to the therapeutic mode, the “MAX INFLATE” button must be pushed twice to return to the “MAX INFLATE” condition. This action resets the automatic timer. 4. Comfort Setting Adjustment – Mattress pressure can be adjusted by pressing the soft key to reduce firmness, and the firm key to increase firmness.